"Bert Williams (not the legendary African American entertainer) was the "auteur" of The Nest of the Cuckoo Birds. Williams stars as a revenuer, combing the Everglades in hopes of weeding out moonshiners. He comes across a wayside inn, managed by looney-tune showgirl Ann Long. Seems that Ann is a taxidermist, who has a fondness for stuffing and mounting human beings and displaying them in her grotesque Chapel of the Dead. 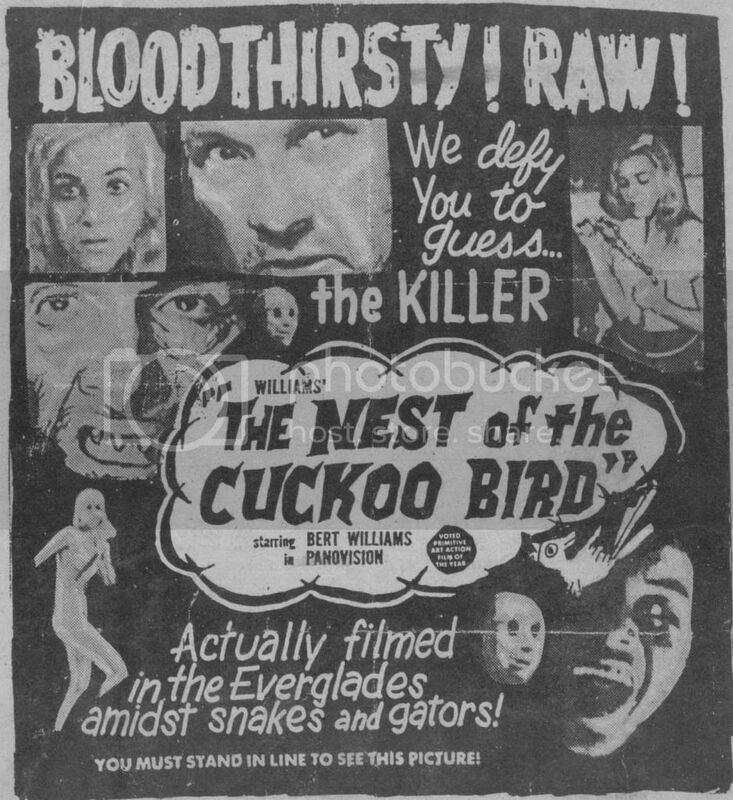 Collectors of recorded esoterica please note: Nest of the Cuckoo Birds has a title tune, performed by the Four Bits (which also seems to have been the film's entire budget). " I've been looking at for this, but online sources indicate this is a "lost" movie. Maybe a reel will turn up in somebody's garage, but the days of that happening are fading. I've been looking online for quite sometime, but every description I come across seems like it's copied and pasted from before. I hounded 'Something Weird Video' for years on trying to find The Embalmer from 1966 and they eventually came through, but I'm afraid that this one is just too obscure.